©Tariq Zaidi, All Secure, Mongolia, Western Mongolia is one of the least densely populated places on the planet. Surrounded by glacier-wrapped mountains, arid plains, barely any trees and temperatures which fall below -40C, life can be brutally hard for the nomadic families who make their homes and tend their cattle here. It is also one of the few places where you will still find Kazakh eagle hunters. The ancient art of training a golden eagle to hunt for foxes, marmots and even wolves, may have been practiced for 4,000 years, but is still very much a part of daily life for the families who depend on it for their survival. 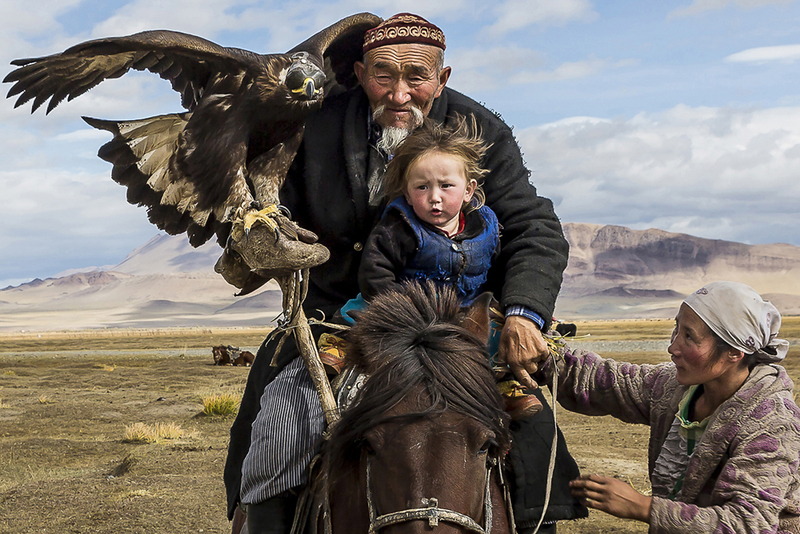 Hunting with eagles is not the only tradition the Kazakh nomads cling to in a rapidly changing Mongolia. With their own language, clothes and customs, this community live by a strong code of unwritten laws which structure an ancient, transient way of life in a stark, inhospitable but beautiful terrain. Photographer Tariq Zaidi spent weeks living with nomadic Kazakh families and learning about their lives. In Feb 2018, Tariq was awarded one of the top Premier Awards in POY75 (Pictures of the Year International Competition) – “Photographer of the Year” Award of Excellence for his work from North Korea, Congo and Brazil and also 2nd place News Division/Feature Category in the same year. Since Aug 2015, Tariq’s stories, images and videos from Angola, Brazil, Cambodia, Chad, Congo, Ethiopia, Georgia, Indonesia, Mongolia, North Korea & South Sudan have been featured internationally in over 700 magazines/newspapers/websites (in more than 60 countries) including: The Guardian, BBC News, CNN, National Geographic, Smithsonian Magazine, Los Angeles Times, The Washington Post, Der Spiegel Magazine, El Pais, GEO Magazine, The Independent On Sunday Magazine, Marie Claire, Esquire Magazine, Frankfurter Allgemeine Zeitung, The Telegraph, El Mundo Spain, Khaleej Times UAE, ITV News, MSN News, LensCulture, L’Oeil De La Photographie, Internazionale Magazine, The Times of London and many more. He has won many major international photography awards, shown his work in over 45 international exhibitions and completed commissions in Sierra Leone, Cuba, Russia, Cambodia, Uganda, UAE, Japan and Indonesia. 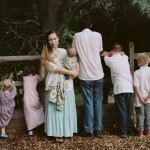 Tariq works as a freelance photographer based out of London, UK. He is currently working on a long-term personal project developing a visual anthology capturing the dignity of humankind in some of the poorest communities in the world. 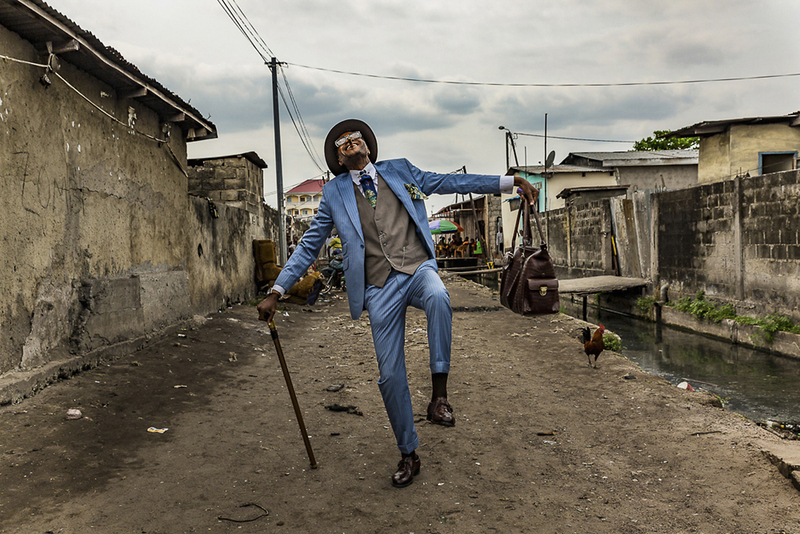 ©Tariq Zaidi, The Sapeur of Brazzaville, Elie, 45, struts his stuff in the streets of Brazzaville. He has been a sapeur for 35 years and his elaborate outfits bring joy to himself and his community. Brazzaville, Republic of the Congo. La Sape, an abbreviation of Société des Ambianceurs et des Personnes Élégantes (“Society of Ambiance-Makers and Elegant People”), is a subculture centered on the cities of Kinshasa and Brazzaville in the DRC and Republic of Congo. Someone who follows La Sape is known as a Sapeur. 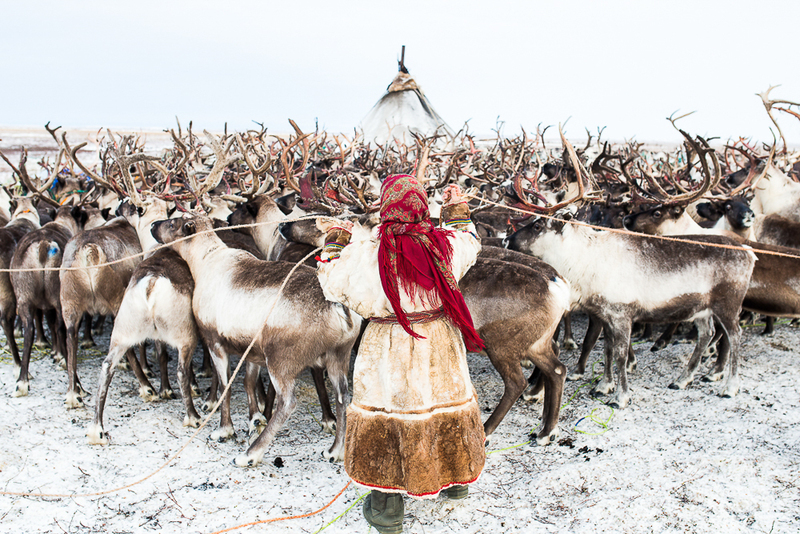 ©Bai Xueqi, The Return, A Nenets woman splits the reindeer in her camp, around 200km from Salekhard, Russia, on Nov. 4, 2017. The Nenets are an indigenous people in northern arctic Russia. According to the latest census in 2010, there are around 45,000 Nenets in the Russian Federation, most of them living in the Yamalo-Nenets Autonomous Okrug and Nenets Autonomous Okrug. 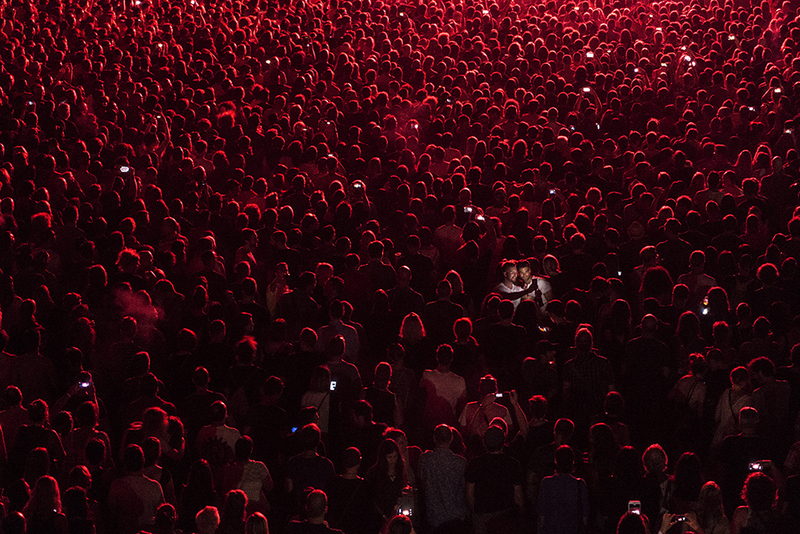 A photojournalist since 2012, Bai Xueqi currently works in Moscow. His photos have been used by news outlets around the globe. 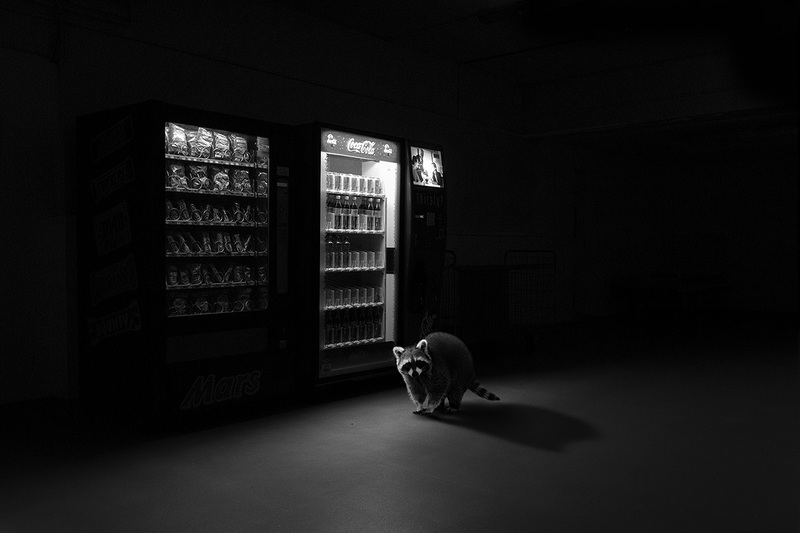 ©Jason McGroarty , Totem Raccoon, In the animal kingdom, the only thing we can count on is unpredictability, that the unexpected should be expected, Through Totem I wanted to capture the heart-stopping moment when the wild breaches the barriers of the city and reminds us that the line between humans and wildlife is not as clear-cut as we would like to believe in, and that in the animal kingdom, the only thing we can count on is unpredictability, that the unexpected should be expected. Jason McGroarty (Irish, b.1992) is a multi-award winning, self-taught photographic artist who is best known for his conceptual work exploring the relationship between man and nature. The characters of which are depicted in almost tarot-card-like mystical figures. Also known for his minimalist approach to photography, McGroarty creates his masterpieces with only entry-level equipment, often building his own lighting, studio’s and props from unwanted materials. This motto has secured sponsors with international top dogs such as Nikon in their ‘Learn & Explore’ project promoting the quality of work that can be achieved with a masterful understanding of light & composition. 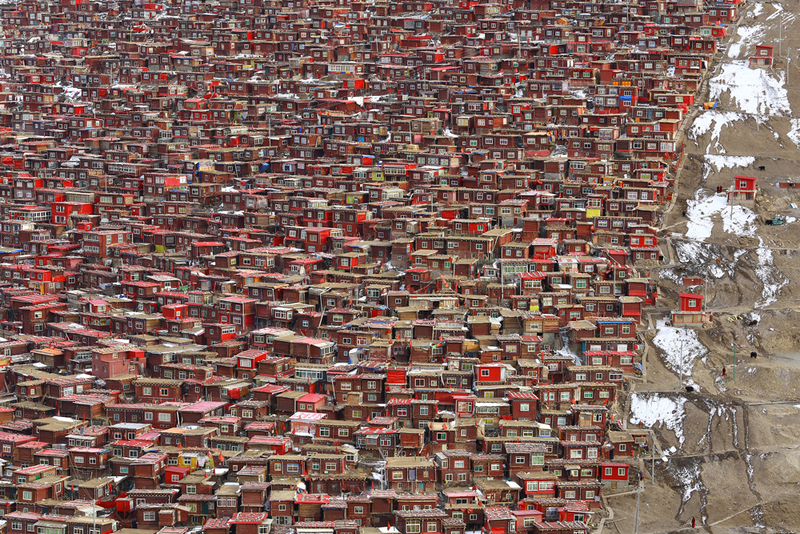 ©Yoong Wah Alex Wong, The Red sanctuary, The Red Settlement at She Da, China, for Tibetan Buddhism continue to grow and extend its housing for Tibetan Buddhists who wishes to devote themselves to the religious study. The captured images reflecting an ongoing construction, a dense yet congested red and rhythmic pattern of the Buddhism sanctuary. Yoong Wah Alex Wong was born in Kuala Lumpur, Malaysia and has a MFA from Savannah College of Art and Design, Georgia, USA. Currently he is a faculty member at Sabanci University, Istanbul, Turkey, giving courses in the area of Digital Modeling, Computer Animation, Digital Video, Motion Graphics and Arts. He travelled to more than 36 countries and he has been active in photography for the past 16 years. He has received numerous honours such as the International Photography Award (IPA), PX3 Award, The Spider Award, Worlds Photographic Award and the Worldwide Photography Gala Award. He is a regular editor/photographer to Photo Creator Publication and a guest speaker to Malaysia National Art Gallery for photography seminar since 2004. His artworks have been exhibited and showcased at various galleries across Brazil, France, Japan, Malaysia, Singapore, Turkey and USA. 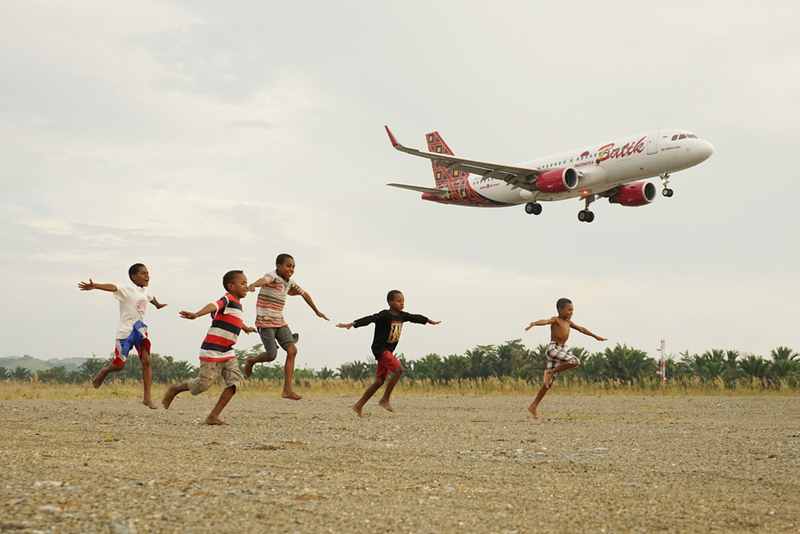 Alamsyah Rauf was born in a small district in south sulawesi precisely in Kab.Sinjai, maybe that’s why this photographer is less known among photographers in Indonesia but his work has won dozens of world-class photo contest. After graduating high school, this man married in 2001 on the will of his parents, this makes him unable to continue college.After married Alamsyah worked in his parents’ photo studio. Alamsyah Learning DSLR cameras just look at the camera manual and learn self-taught to techniques of composition, tone, and lighting via internet.2004 Alamsyah Rauf set up his own Photo Studio and hire 3 photographers. As a freelance photographer, Alamsyah take part in various photography communities, photo exhibitions and participate in various national and international photo contest. 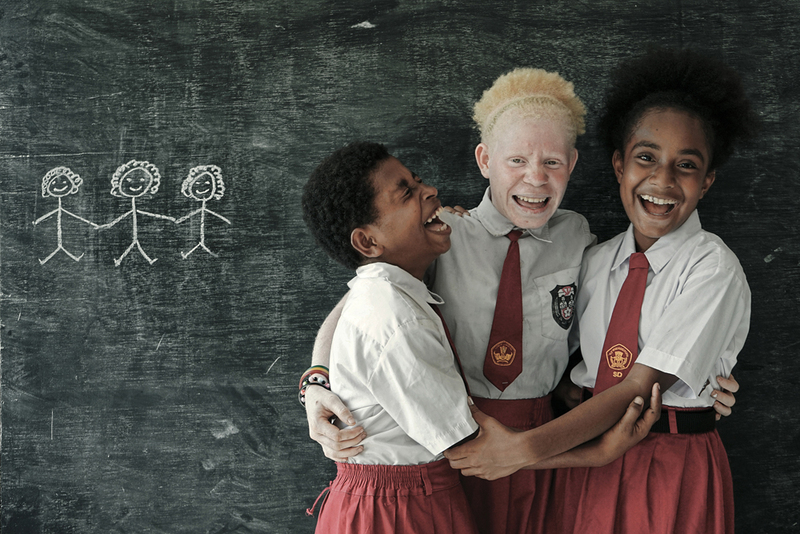 ©Alamsyah Rauf, Amity, Taken in Sentani Indonesia,an albino girl with two friends at the Sentani elementary school.In this school there is mutual respect ,no bully,no racist. 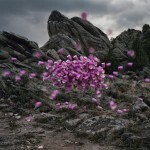 Jamie Johnson is a Los Angeles photographer specializing in children and alternative processes. 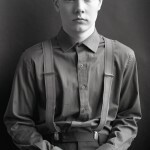 Winner of the Julia Margaret Cameron Portfolio Award and Spider Black and White Photography Award. 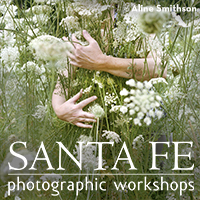 Her work has been published in many photography magazines and is exhibiting in galleries worldwide. Jamie’s work is in the permanent collection of the Hammer Museum in Los Angeles and Archaelogy Museum in Alabama and currently has a show at the Norton Museum of Fine Art in Palm Beach Florida. As a mother and fine art photographer whose bread and butter comes from photography, my passion for faces of the next generation has been a life long focus. I travel the world capturing images children and childhood around the globe. From Laos to Cuba, from the Amazon to India, I have found a universality in the world of children. I have always been particularly interested in observing how girls are raised, examining the morals, values, and education of the next generation of young women. My work has been exhibited Internationally in galleries and museums from New York thru London and Paris, and has been published in dozens of magazines. As a mother and fine art photographer whose bread and butter comes from family and child photography, my passion for faces of the next generation has been a life long focus. In my free time, I travel the world capturing images children and childhood around the globe. From Laos to Cuba, from the Amazon to India, I have found a universality in the world of children. I have always been particularly interested in observing how girls are raised, examining the morals, values, and education of the next generation of young women. 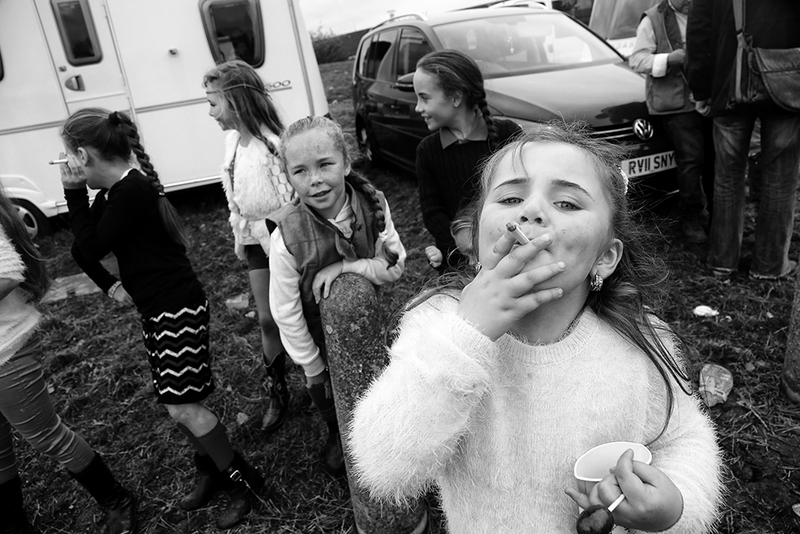 Three years ago, I was invited by a photographer friend to document a community of Irish Travellers during an event when travelers come from all over the Ireland and Europe to connect, sell puppies and ponies, and catch up with friends and family. The kids run free with plastic guns, squirt guns, dolls, ponies , puppies and candy cigarettes catching up with cousins and grandparents. The Travellers set up camp at the festival, where family and friends can reunite and share stories. It is not an easy community to penetrate, they have faced such discrimination and racism they are very skeptical of outsiders. It was an amazing journey and I made connections with so many kind and generous families. They allowed me to photograph their lives and cultures. The children followed me around and took turning using my cameras. I learned their traditions of being sharply dressed young boys and overly dressed young girls yet still very catholic, their goals of falling in love, getting married young and producing many children. and a strong sense of taking care of each other and family values and always respecting God. Travellers are an indigenous minority who, have been part of Irish society for centuries. Travellers long shared history, cultural values, language, customs and traditions make them a self-defined group, and one which is recognizable and distinct. Their culture and way of life, of which nomadism is an important factor, distinguishes them from the sedentary (settled) population. The Irish Travelers are a nomadic population, living on the fringes of society. Often uneducated, this Catholic community is required to marry within their clan. There are an estimated 25,000 Travellers in Ireland, making up more than 4,485 Traveller families. This constitutes approximately 0.5% of the total national population. It is estimated that an additional 15,000 Irish Travellers live in Britain, with a further 10,000 Travellers of Irish descent living in the United States of America. Travellers, as individuals and as a group, experience a high level of prejudice and exclusion in Irish society. Anuar Patjane is a social anthropologist, photographer and scuba diver born in Puebla, Mexico in 1981. He has received the World press photo second place Winner in 2016, Nature category and the National Geographic Traveler photo contest 1st place winner 2015. 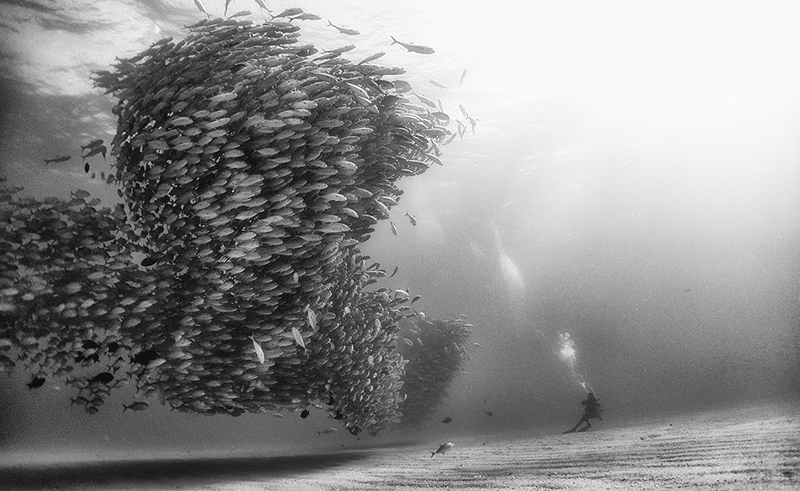 A school of Bigeye Trevally forming a “tornado” at Cabo Pulmo National Park, Mexico. I took this photograph during one of my three exploration trips to Cabo Pulmo in 2015, the diver in front of the tornado school is park ranger Leonardo who accompanied me during that week of exploration. New research shows that schools of fish are self organized aggregations that learn and remember as a group and not as individuals. This new information needs to be taken into account by fishing regulations so fishing techniques could be modified in order to preserve the health of the whole fish population and never fish the whole community. 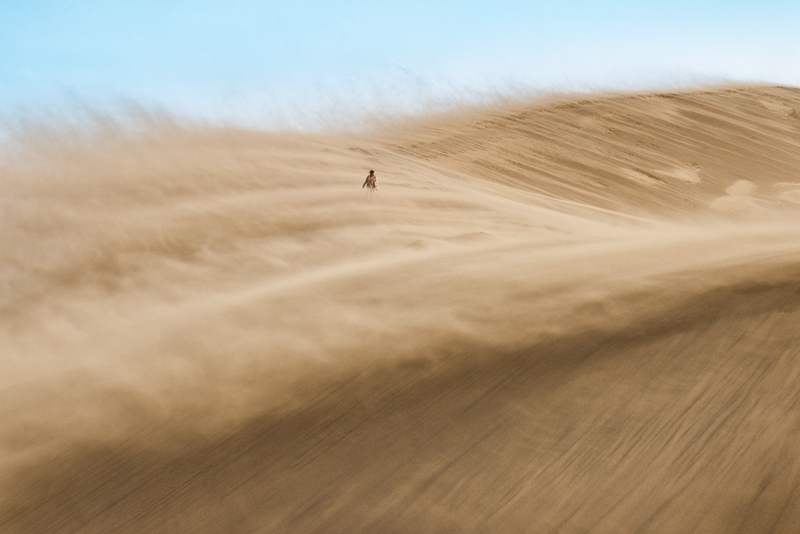 ©Alesya Osadchaya, Wanderer, Kazakh Ranger in the Sandstorm on the Singing sand dune, National Park Altyn-Emel, Kazakhstan Sandstorm like this was once-twice in a year. Alesya Osadchaya was born in October of 1990 in Moscow, Russia. She studied veterinary medicine at the Moscow Veterinary Academy. Currently, he also works as a teacher in the field of veterinary entrepreneurship. The fascination with photography came from childhood. Dad taught her to handle the camera, later she got carried away with photography seriously and began to earn money by taking pictures – portrait and reportage. After graduation, the institute began to travel and take pictures of more scenery and travel reports. Travel and photography are closely related. Alesya rarely uses the services of travel agencies and travels alone. Always takes a camera with her. Through photographs, she shows the fragility of man compared to the forces of nature. No wonder they say that the most cool photos are obtained at a time when the elements are raging. Nature opens on the new side. In bad weather, few people can force themselves to leave the warm bed and go to meet the unknown. At this time, and people who are on the street once pretend to wear “masks”. They are busy with more important things – how not to get wet, do not mess up your hair, save your property, and even the safety of your life, after all. But these are not all. 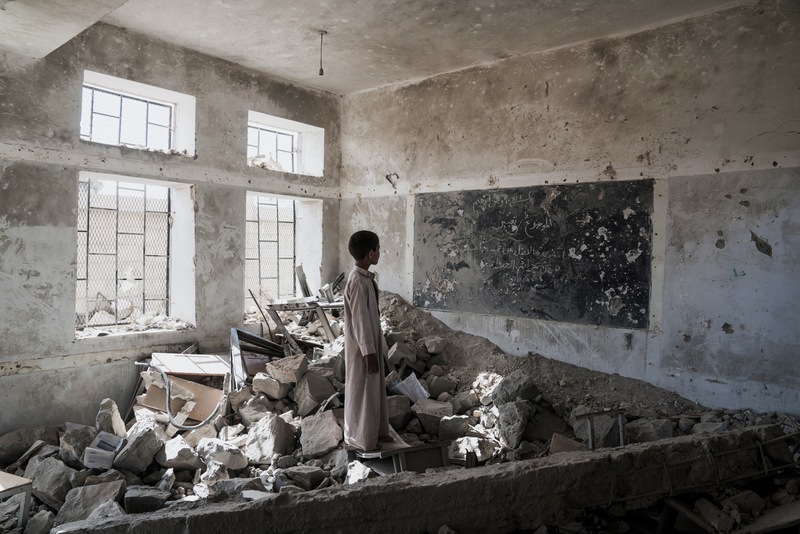 ©Giles Clarke, AAL OKAB SCHOOL , SAADA CITY, YEMEN – 24 APRIL 2017, A student at the Aal Okab school stands in the ruins of one of his former classrooms, which was destroyed during the conflict in June 2015. Students now attend lesson in UNICEF tents nearby. Over three million children currently have little or no schooling in Yemen today. Giles Clarke is a photojournalist with Getty Images Reportage based in New York City. Giles started his career as a 16mm camera assistant in a daily news production company in Berlin in the mid 1980’s. He then trained and worked as a professional black and white photographic printer in London and New York City during the 1990’s. He spent over 12 years in the darkroom printing for fashion and advertising clients -including the late Richard Avedon in 1995-96. After a stint in Los Angeles working for UK’s Channel 4 and on web-based content for commercial clients, Giles returned to New York in 2008 to pursue still photography. Now focusing almost entirely on humanitarian and conflict issues, Giles’s work has been featured recently by The United Nations (OCHA), American Photography 31 and 32, Amnesty International, CNN, The Guardian, Global Witness, The New Yorker, The New York Times, National Press Photographers Association, Paris Match, PDN, POYi, TIME, Visa Pour l’Image-Perpignan, and Internazionale Magazine et al. He is the Lucie Foundation’s ‘Deeper Perspective Award’ Photographer of 2017 and the ‘Imagely Fund Fellow’ of 2018 for his recent work in Yemen. Jennifer Garza-Cuen is an artist from the Pacific Northwest. Currently Assistant Professor of Photography at Texas A&M University-Corpus Christi, she received her MFA in photography from the Rhode Island School of Design. Jennifer is the recipient of numerous fellowships and awards including the Robert Rauschenberg Foundation and Light Work Residency Awards. 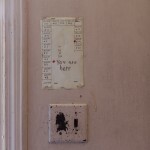 Her work has been exhibited internationally and published in a variety of contemporary photographic journals. 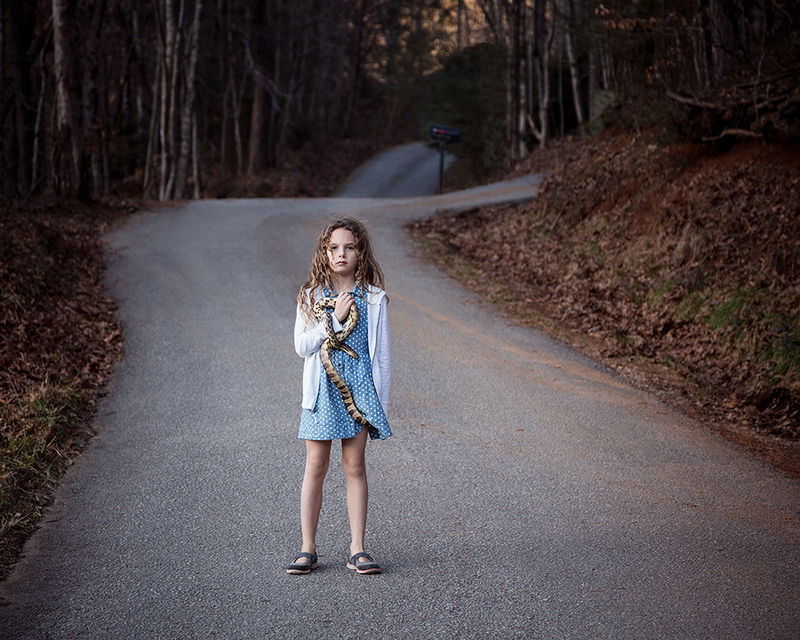 Rabun is part of Imag[in]ing America, which depicts a series of locations in the United States as a residue of cultural memory, an inheritance. It is a metaphorical memoir, a narrative re-telling of facts and fictions and it is also a discovery of the dreamland that still is America. © Marco Panzetti, February 22nd 2017, Mediterranean Sea. A rubber boat adrift at sea, overloaded with migrants, photographed in international waters off the coast of Libya. 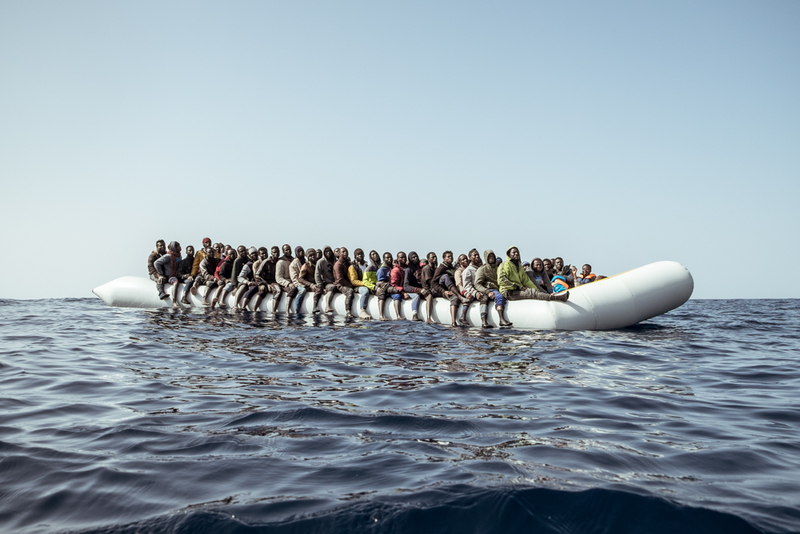 Data on the rescues conducted by the rescue vessel Aquarius show that smugglers are increasing the number of migrants crammed in the inflatable boats used for the trafficking: up to 150 people in 12/15-meters long inflatable boats. His long-term body of work on the European migrant crisis, ‘The Idea of Europe’ (2015 – present) received international recognition including an Honorable Mention at the 2017 Lange-Taylor Prize and the first prize in the video category at the 2017 Migration Media Award. ‘The Idea of Europe’ is a long-term documentary work on the human impact of the European refugee crisis. Fleeing from conflicts, humanitarian crisis and economical distress in their countries of origin, and escaping the slavery practices commonly reported in Libya, since early 2015 more than 10,000 people lost their lives in the Mediterranean trying to reach Europe, and about 3 million people applied for asylum in EU countries. This huge influx highlighted the limits and unfairness of border control policies and asylum systems still anchored to the post-WWII treaties, and caused a major discussion among the public opinion. Can Europe still indulge in considering itself the cradle of human rights? In the space of a few decades, the landscapes of the Arab Gulf region have undergone a wholesale mutation driven by increased income from the oil, globalization and mass tourism. These countries have seen so a huge transformation, moving from the nomadic lifestyle of the bedouin tribes to a hi-tech urban society. The work takes the title from an arabic expression meaning “from the land”, and is an observation of this process oscillation between these two poles: an austere, traditional civilization on one extreme, and a postmodern culture under the powerful influence of capitalism and consumerism on the other. Founded on the idea of travel as an artistic method, these photographs hold up a mirror to the dyad of nature and technology in a place where the old and the new come together and the lines between them blur. 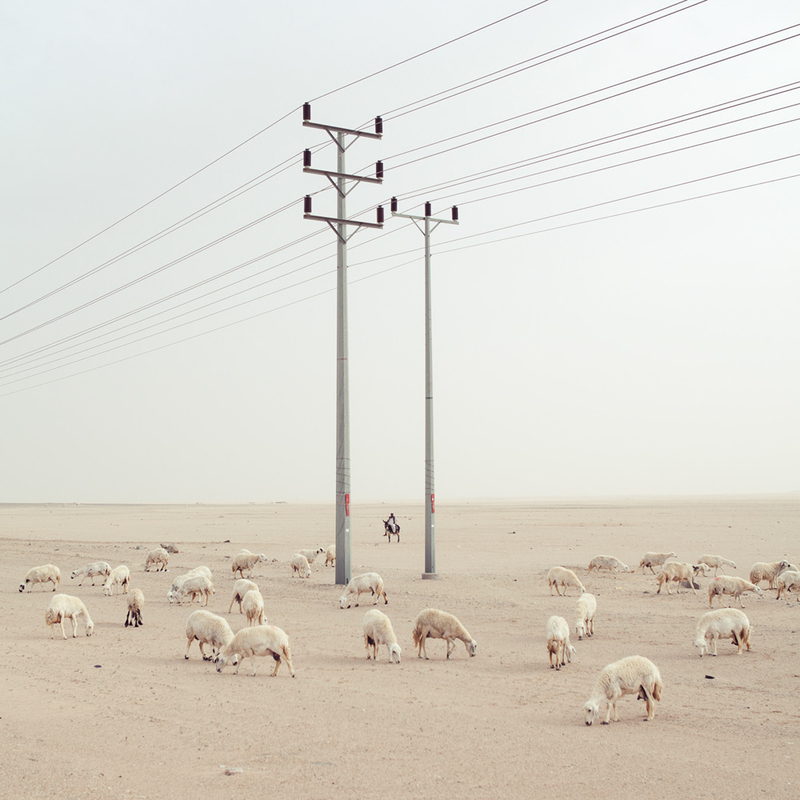 This tension is evident both in the vast desert landscapes and in the images of cities, where the past and the future are compressed into the close quarters of the present. These representations of the landscapes of Saudi Arabia, Oman, Bahrain, Kuwait, United Arab Emirates and Qatar throw into sharp relief the binary opposition of the natural and the constructed. This sense of dislocation feeds into this idea of travel as an artistic dérive, drifting with no particular destination in mind, in search of new situations and experiences. Rossi Fang is an amateur photographer who loves photography and likes to record every moving moment. The temple lively celebration,is the most representative of Taiwan’s traditional culture. Tiger grandfather, the least not afraid of firecrackers gods. 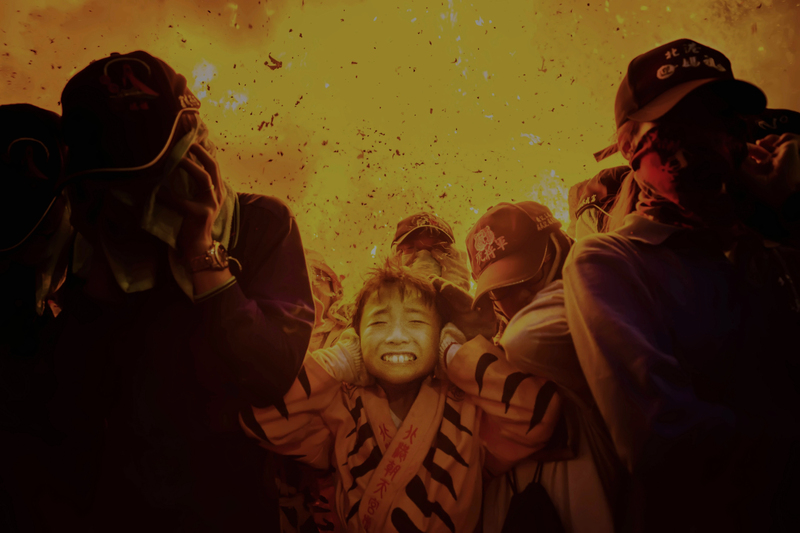 Sweet and innocent child put on tiger dress clothes, not afraid of firecrackers on behalf,like real divinity. Jelena Janković is award-winning fine art photographer, specialized in dance and theater photography. Actively engaged in the documentary, freelance fashion, conceptual and experimental photography. She has exhibited at twenty groups and seven solo exhibitions and has been credited for photography in over 40 theater productions. Her photographs have been published: Rolling Stone (DE), Professional Photographer (USA), ELLE (SRB) Digital SLR Photographer magazine (UK), fotoMAGAZINE (DE), LensCulture,Lürzer’s Archive, GEO (DE, ESP), National Geographic (SPA)…She is a member of The Association of Fine Arts Artist and Designers of Serbia. 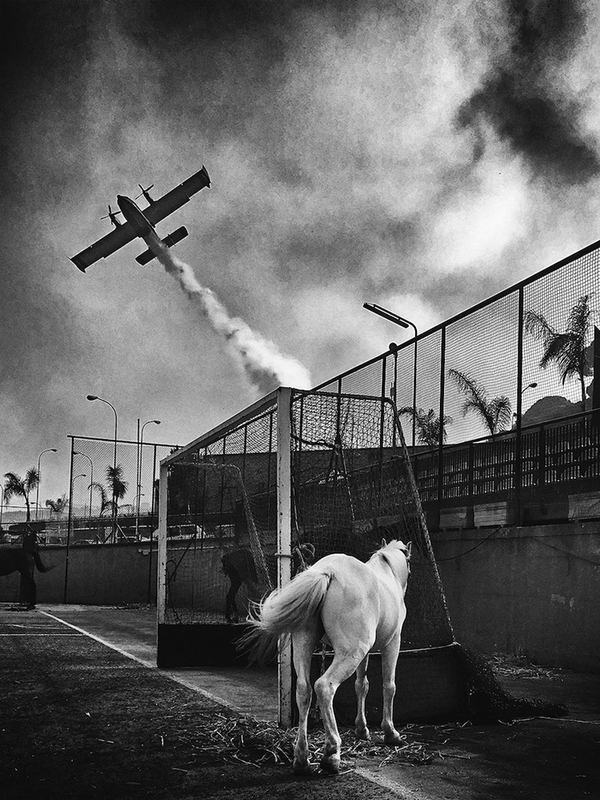 ©Simona Bonanno, July 10th, 2017 – 5.58 p.m.: Horse in a soccer field after being evacuated from the stable due to a huge fire. Finally the Canadair turns off the nearby flames. Simona Bonanno was born in Messina, Italy, in 1974, to a family involved in the arts. She received her first camera from her mother when Bonanno was studying photography at the School of Arts in Italy. She has also lived and studied in Paris where she still frequently works. Her photographs have been included in several exhibitions in Europe and abroad. She currently lives in Messina, Italy. She works between her city and Paris. July 2017: 131 fires break out with intensity for days in the area of Messina, Sicily. During the night between the 9th and 10th of July the stables of the CUS, (University Sport Campus) were evacuated due to the tremendous fire. Horses and dogs were brought to the campus soccer field. There, they spent the night waiting for the firefighters and the canadairs (firefighting flying boat amphibious aircraft) to douse the flames. On the afternoon of the 10th the fires’ intensity increased becoming quite dangerous. The whole campus was evacuated, and the horses were taken further away. Filippo Venturi is an Italian documentary photographer working on editorial, corporate, commercial assignments and personal projects. His works have been published in different newspapers and magazines such as The Washington Post, Financial Times, Vanity Fair, Internazionale, La Stampa, Geo, Marie Claire, Die Zeit, Gente, D di Repubblica, Io Donna/Corriere della Sera. He cooperates with several agencies in Italy and abroad for advertisement projects. He also pursues many personal stories and projects on the critical issues that he finds interesting. 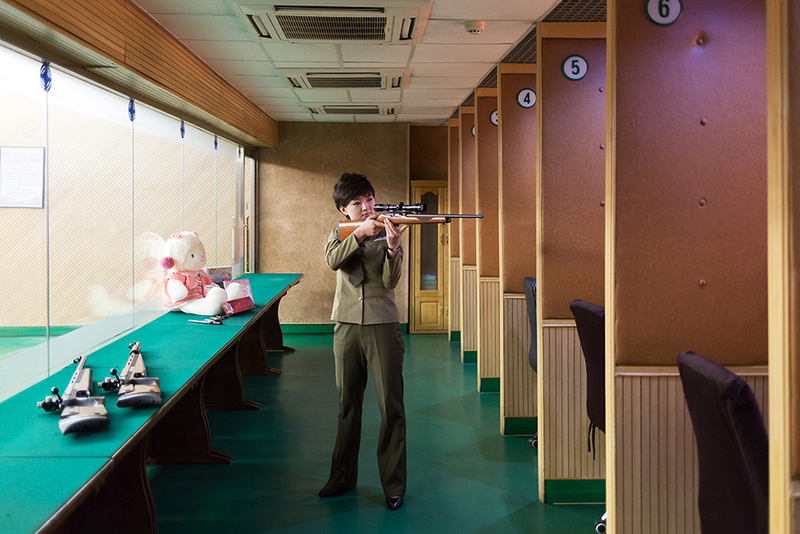 In 2016 his work, “Made in Korea” about South Korea, has been hosted at the Italian Center for Fine Art Photography in Bibbiena, at Modena’s Foro Boario as New Talent selected by the Modena Foundation Photography, at Rome’s Museum of Contemporary Art (MACRO) as selected Emerging Talent and at Somerset House in London by the Sony World Photography Awards. In 2017 he was the photographer sent by Vanity Fair in North Korea. In 2018 he is Testimonial Photographer for Fujifilm. 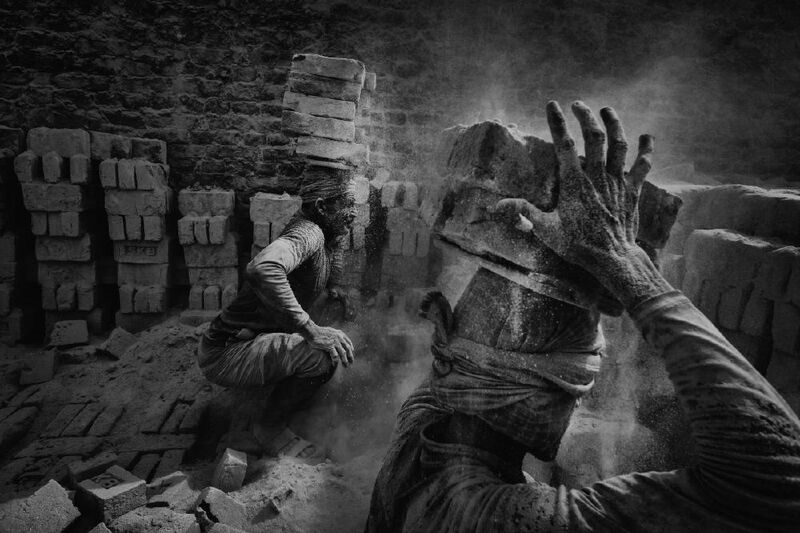 ©Alain Schroeder, Brick Prison, Bangladesh, The technique of collecting bricks is well established. The men crouch down and using both hands, simultaneously place two bricks on a flat piece of wood resting on their head. But every movement stirs up a fine cloud of dust that covers them completely as it settles, transforming them into earth statues and endangering their health. 20 km east of Dacca, the periphery reveals many brick factories where men, women and very often children work in difficult and dangerous conditions. In this industrial complex, men prepare the earth using a mold to make bricks of gray color. After drying in the sun, they will go into a giant oven; a sort of long tunnel similar to those of coal mines. Overwhelmed with dust, in an infernal heat, women and children carry the bricks outside in wheelbarrows. With about 11,000 brickworks across the country, Bangladesh is struggling to meet the construction demands of a rapidly growing population. Armies of workers including women and children suffer the hard manual labor, in extremely poor conditions, for merely $1 per day. Working 12-18 hours, without access to fresh water or decent food, children as young as 4 contribute to the monumental task of producing 1500 bricks per person per day. Families live in makeshift camps near the factories breathing air filled with arsenic and particles of burnt plastic. Despite the 2011 directives from the OECD and the UN, holding multinationals accountable for workers rights and good labor practices all along the manufacturing chain, the reality on the ground is rather substandard. Several associations have launched campaigns under the name “Blood Bricks”, to heighten awareness around what is essentially a form of slave labor. Particularly active in India, unions, ONGs and other human rights organizations are staging events to inform local populations and mobilize workers in order to improve working conditions, increase pay rates and above all, eliminate child labor which leaves kids uneducated, exploited and trapped in poverty. 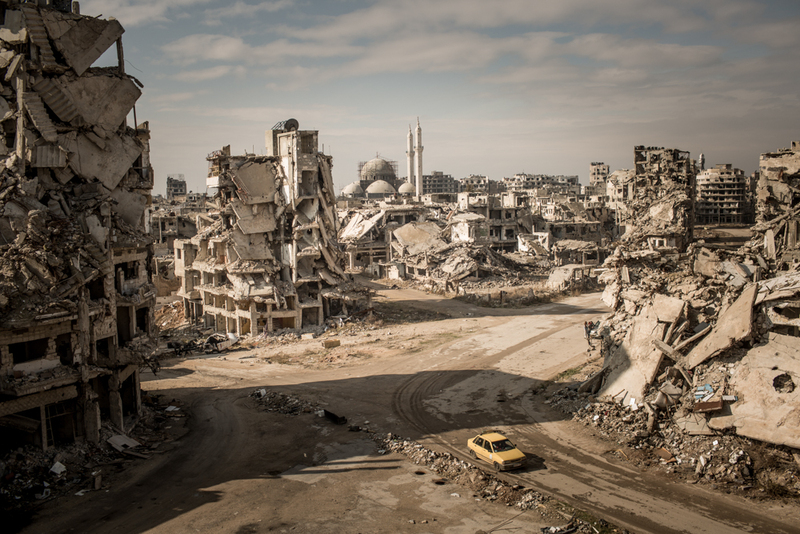 ©Christian Werner (Germany), Road to Ruin, Syria, January 2017 – Large parts of Homs are completely destroyed. Nevertheless, some residents come back and try to rebuild their homes. Three quarters of Homs consists of ruins. Taxi drives through ruins. 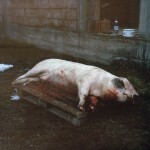 Christian Werner is a freelance multimedia/photojournalist based in Boitzum, Germany. 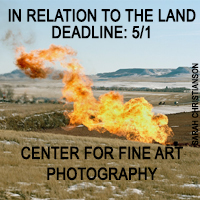 Born in 1987, Chris studied photojournalism and documentary photography from 2009 to 2014 at the University of Hanover. He works as a freelance photojournalist and published his photos and stories, among others, in Der Spiegel, Die Zeit, TIME, The Washington Post and many more. From 2012 to 2016 Christian Werner was represented by the German reportage agency laif. Since late 2016 Chris has been represented by Zeitenspiegel. His photographic focus is the processing of social injustice, conflicts and geopolitical issues. His work has received awards several times and has frequently been exhibited internationally. In 2015 Chris participated in the World Press Joop Swart Masterclass in Amsterdam. In 2016 Chris was chosen in the 30 under 30 Europe Forbes List in the Media category. In late summer 2016 he began working with MOAS (Migrant Offshore Aid Station). Chris has worked in various countries in Asia, Africa, Eastern Europe and South America. 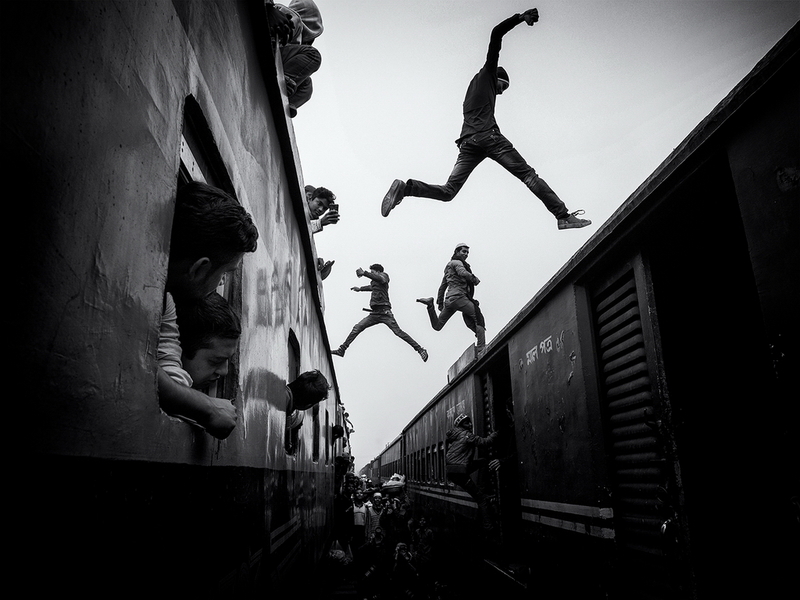 ©Marcel Rebro (Slovakia), Train jumpers, Boys jumping from one train to another during Bishwa Ijtema. The Bishwa Ijtema is an annual gathering of Muslims in Tongi, by the banks of the River Turag, in the outskirts of Dhaka, Bangladesh. It is now the second largest Islamic congregation at 4 Million pilgrims. ©Bence Mate (Hungary), White Fang This leopard was eating the carcass of a Wildebeest, while we were watching and shooting it from close range. Suddenly, a hyena appeared and it started annoying the leopard with its characteristic laughter and pacing. The big cat would not give up its prey easily: in a threatening posture it flashed its fangs and huffed to prove the intruder that he was much stronger. This seemed to work until the hyena was joined by another one and then another one. Finally, the three of them outnumbered the leopard. Bence Máté is a Hungarian wildlife photographer. 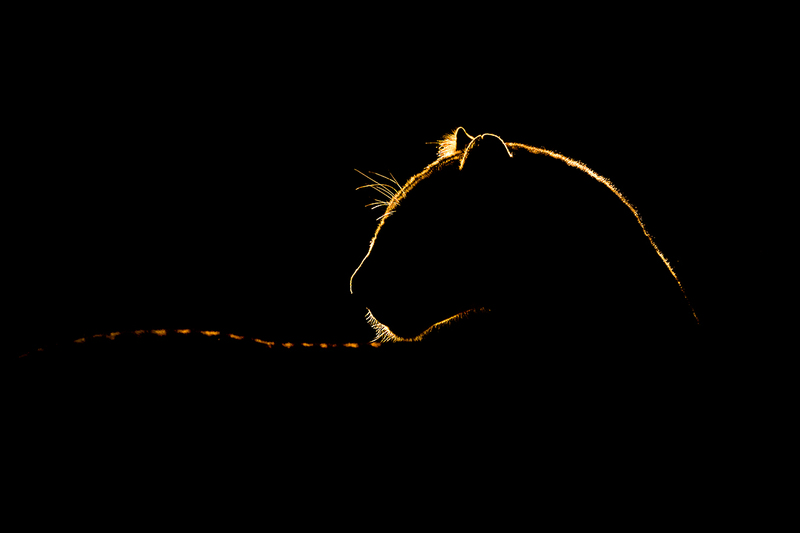 He pioneered the one-way glass photography technique now popular among hide-based nature photographers around the world. In 2010, his image ‘Marvel of Ants‘ won the prestigious Wildlife Photographer of the Year grand title, making him the only contestant to date to win the grand title prizes in both the young and adult categories of the competition. According to the non-profit Bridge Budapes association, Bence is the ninth most well-known Hungarian (living in Hungary), in the world. 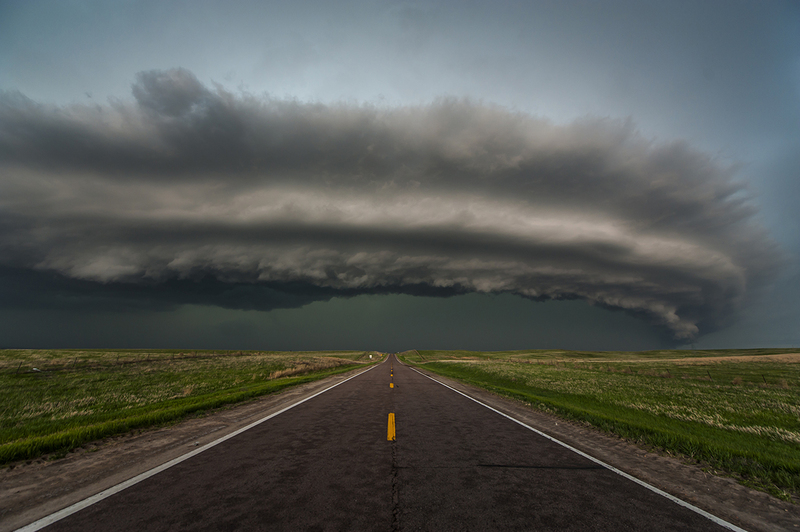 ©Colt Forney (United States) Big Springs, Nebraska, A severe thunderstorm rages across the plains of western Nebraska producing large hail and damaging winds. 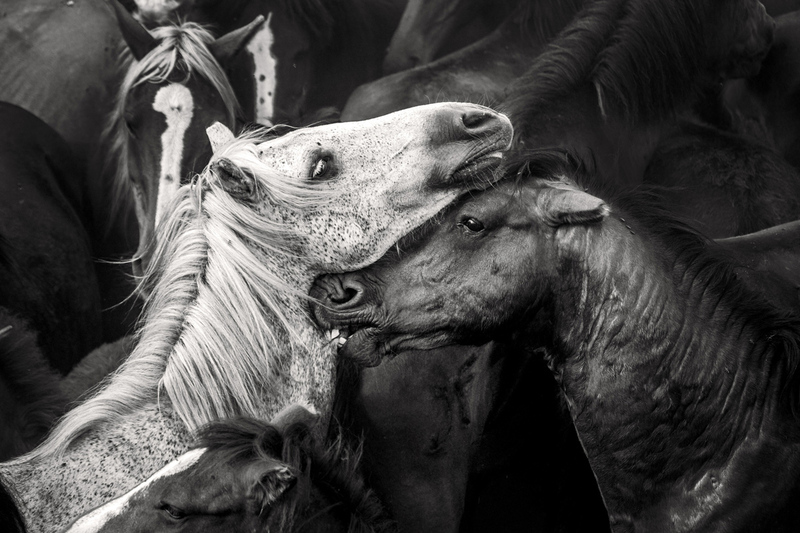 ©Javier Arcenillas (Spain), Rapa das Bestas, Rapa das Bestas is the name of an operation that involves cutting the manes of the wild horses who live free at the mountains in a semi-feral state and that are performed in the curros (enclosed which retain the horses) held in various locations in Galicia (Spain). Those horses live in mountains owned by the villages (a form of property derived from the Suevi, around 8th century) and have several owners. Humanist. Freelance photographer, member of Gea Photowords. Javier Arcenillas develops humanitarian essays where the main characters are integrated in societies that borders and sets upon any reason or (human) right in a world that becomes increasingly more and more indifferent. He is a psychologist at the Complutense University of Madrid. He has won severeal international prizes, including The Arts Press Award, Kodak Young Photographer, European Social Fund Grant, Euro Press of Fujifilm, INJUVE, Foto Press Third Prize, Luis Valtueña of Médicos del Mundo, Journalism Doñana´s prize, Luis Ksado, Make History, UNICEF, World Photography of the Year, Fotoevidence, Finalist of the Leica Prize 2009 and Antropography 2010. In recent years he has fulfilled photographic essays about Latin america outstanding “Territories”; in Jamaica he realized “Marihuana Traffic”; “Gladiators” from the Olympic School of Boxing in Havana and “Weapon Social Club” and love to arms in the USA society. For his work with Médicos del Mundo about the Rubbish Cities in Central America, he has been a finalist for the Ojo de Pez Prize and his book “City Hope” summarizes his five years working on it. He has published in magazines a society portrait book “REVOLUZION” in which he sums up his daily activity alongside a photographic essay about charity in India tittled “Kingdom Charity”. He is a regular photographer for Fronterad, (Global Group) and in Alcobendas´ Town Hall. His reports abroad can be found in some outstanding publications such as Time, Der Spiegel, Stern, Guatemala´s newspaper or Miami Herald Magazine. Recently he has published “WELCOME” a book about the camp of refugees in Myanmar´s Rohingya in Kutupalong, aided Médicos sin Fronteras and worked on an article about ship breakers in Asia, “ShipBreakers”. Since the end of 2010 he´s been working on “SICARIOS”. A violence and death story in Latin America shown in Photo España 2011. Currently he is carrying out new ideas in parallel with traditional journalism to spread his projects and he is making up Audiovisual Projects with diplomatic work. Andy Yeung is a photographer keen on landscape, architecture and aerial photography. 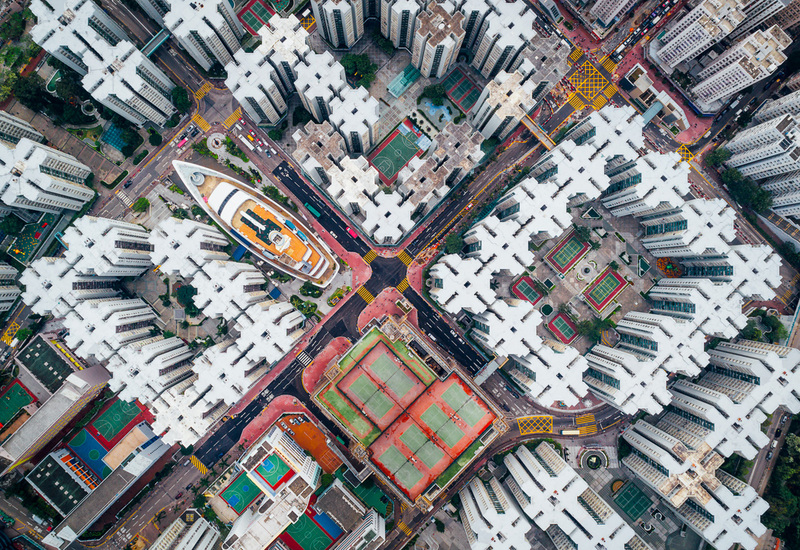 As a born-and-raised Hong Konger, he learned to cull inspiration from the familiar especially when coming up with shots of this over photographed city. Two years ago, he discovered a new passion for aerial photography. He put together several aerial series including Urban Jungle, which attracted international attention. His recent 360-degree photos went viral on Facebook and been shared thousands of times. He’s worked with various internationally known newspapers and companies such as BBC, CNN and DJI.